Putrajaya Botanical Gardens is a must-see attraction if you are visiting the beautiful city of Putrajaya. There are eight major parks in the city which is sometimes referred to as a 'City in the Garden'. The Botanical Gardens is my favourite park. I live quite close by so I have visited a number of times and with so many varied plants and trees on display which bloom or flower at different times of the year there is always something new to catch the eye. Like the rest of the city of Putrajaya, the Botanical Gardens are still quite new having been planted on 230 acres of former agricultural land during the past decade. Unlike the established botanic gardens in places like Singapore and Penang which are well over 100 years old, Putrajaya's trees are not yet fully grown but the skilful planting of trees and shrubs, together with some well planned hard-landscaping have combined to create a pleasing appearance for the visitor. Not to be missed are the Canna Walk, Fern Garden, Floral Steps, African Collection, Tropical America Collection, Hibiscus Walk, Bougainvillea Tunnel, Pandanus Walk, Orchid Path, Palm Hill, Vine Garden, and Heliconia Trail. The hard landscaping includes a canopy bridge, a huge sundial, covered walkways, a lake boardwalk, gazebos and picnic shelters. A superb addition is the exquisite Moroccan Pavilion which you can see inside for a fee of RM3 (admission to the park is free). Other attractions include cycle hire, boating, an interactive exhibition and a tram ride for which separate fees apply. You will no doubt be in need of refreshment after wandering around in all this fresh air. 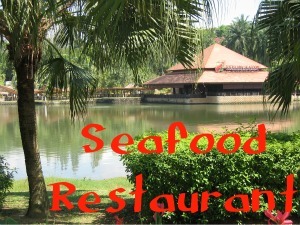 The Putrajaya Seafood Restaurant occupies a prime position on the lake front from where you can get a great view of the Prime Minister's office complex building. The Botanical Gardens are in the heart of the city close to the Istana Melawati (royal palace) and within walking distance of the Putrajaya Shangri-La Hotel. Plenty of parking is available. For information on some of Putrajaya's other parks please refer to my Four Parks Walk article on my blog.